Until they were found, I’d no idea that 12 boys and their coach were trapped in a flooded cave in northern Thailand. But once the news broke, I was hooked. And I wasn’t alone. The national fascination tells us something about PR, storytelling, and ourselves. Why was the plight of the stranded Thai boys so compelling? As many noted, there are children in danger everywhere, from Syria to Syracuse. Some journalists questioned the news judgment that placed a higher priority on the cave rescue than those who were lost when a tourist boat capsized right off the Thailand coast. Others invoked the migrant children separated from their families at the border here. One of the jarring things about the Thai cave story: 41 people died when a boat capsized in Thailand on Thursday evening and nobody really cared. It’s a pretty clear illustration of how we latch onto stories that are gripping while ignoring worse human suffering that lacks drama. So, how were the Thai students different? In the Poynter Institute blog, writer Roy Peter Clark offers a compelling analysis of our collective fascination. 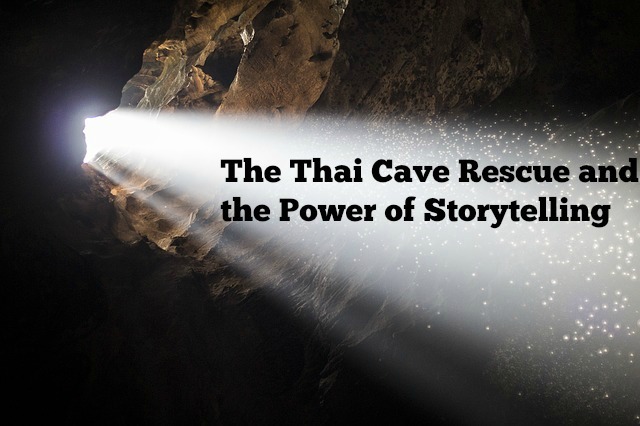 While his post points out how the cave narrative conforms to some storytelling archetypes (and primal fears), it also notes the many ways in which it departs from classic storytelling. For example, the cave story didn’t offer either proximity or “prominence” – well-known personalities (though I’d argue that Elon Musk lent some celebrity cachet to the whole thing.) The lack of proximity actually worked against it. In fact, a frustrating aspect of the unfolding news story was the number of inaccurate and conflicting reports; even major news networks got it wrong, presumably due to the geographical and time zone challenges. But overall, the Thai cave rescue did involve a powerful archetype. People now say that it was simply a “good news” story, but we didn’t know how things would turn out. In essence, it was a typical adventure tale — but with a twist. At the point where most stories would have ended well – the boys’ being discovered by British divers after nine days of searching – the cave narrative was just beginning. When we realized the rescue would be risky, complicated, and perhaps impossible, everything changed. At that point it became a classic hero’s journey – with the heroes being not the lost boys, but the teams of rescuers who risked their lives to bring the kids to safety. Shades of baby Jessica in the well. That’s not all. Ultimately, our fascination with the Thai cave rescue may come down to those intangibles that are scarce in today’s media and social environment. The first is hope against long odds. A human David was up against a Goliath of immense and terrifying natural power. In the face of worsening conditions and sudden setbacks — imminent downpours, declining oxygen levels inside the cave, and the death of an experienced volunteer, we weren’t confident of the outcome, but were hoping to see light at the end of a tunnel. The other part of the cave story was that it instantly brought about something else we’ve been missing — a sense of unity. Let’s face it, each day brings divisive political reports, real and fake outrage over news events and social media reaction, and unrelenting punditry about the state of our disunion. As we waited for news out of Chiang Rai, for once, for a few days at least, we were all rooting for the same team.